New to the series or just want to know a little more? If you have any questions about the Alien 9 / Alien Nine ending or anything else to do with the show and books then check out the Questions page. 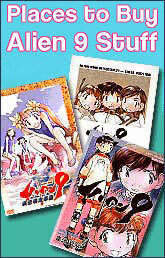 Otherwise here you'll find information on the Alien 9 / Alien Nine series as a whole including the anime, manga and any products that were released. Also in this section are comments and reviews for the anime or manga series. When enough information presents itself there will also be special features on certain people such as the current page on the composer Kuniaki Haishima.